The Armed Forces Reserve Center contains private and open office areas with movable partitions, an assembly hall, weapons simulator room, fitness center, locker room, armored vault, and storage areas placed strategically throughout the facility. The Field Maintenance Shop includes a classroom, library, IT spaces, break areas, locker room, work bays, battery room, flammable storage, bulky equipment storage, and controlled waste handling areas. Profile: Not at all resembling the Armed Forces Reserve Centers of the past, this new facility is impressive on many levels. The goal of the project was to provide a facility that resembled an office building or technical college. At 204,133 SF, the new Armed Forces Reserve Center has been called "breathtaking" due to its current scale by the local media, including an additional 30,000 SF Field Maintenance Shop. Secure parking will be provided for military and privately owned vehicles. 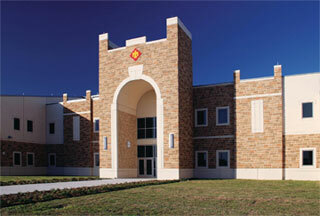 The facilities are designed to meet Anti-terrorism and Force Protection standards. The facility achieved a LEED Gold certification. Services: Our consultants were responsible for certifying design industry compliance for technology. Our effort involved the review of technical specifications and detailed drawings for all low voltage design including IT, AV, security, and OSP.